Do Up Diary #3 – What would you do to Moregeous Mansions?! The existing / current layout. So you’ve seen her from the grotty inside as she was when I bought her all those years ago and also from the outside front garden…. what does Moregeous Mansions look like layout wise? Imagine half a church on its side and you’re pretty much there, a central core, an East facing room, a South facing room and what we’ve nicknamed the West Wing. It’s a semi, so the party wall is the long flat elevation at the top. 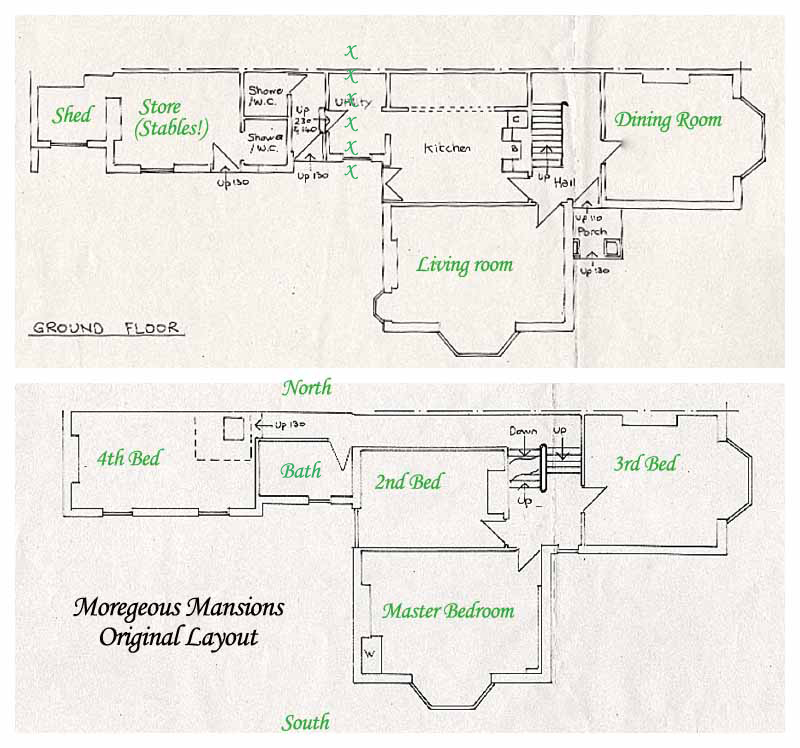 The phrase Original Layout is a bit of a misnomer, because I’m told the West facing section wasn’t originally attached to the house, but rather was a stables block later attached to the main house by the bit where the crosses are on the ground floor. This is now a utility area housing our kitchen sink minus hot water and fridge, and the erroneously named ‘Bath’ is upstairs, i.e. no bath since 2011! By the time I’d bought the run down property in the early Noughties, the stables had long been horseless and the space was being used as an mini office, rented out separately from the main building. After 8yrs of living here, we’ve come to know the house very well, it’s quirks, foibles and the idiosyncrasies. I often tell clients if at all possible to live in their new homes for a while before deciding on renovations as often how you think you’ll live in a property isn’t how you’ll live in it at all. Had we refurbished straight away we’d have pretty much kept the layout as it is, making a large garden / dining room where the stables are by taking down adjoining walls and putting an extra ensuite in the master bedroom. However what you don’t get from the flat layouts pictured above is a sense of the higgledy piggledy nature of the house (which I love), with all the different levels & mezzanines everywhere. 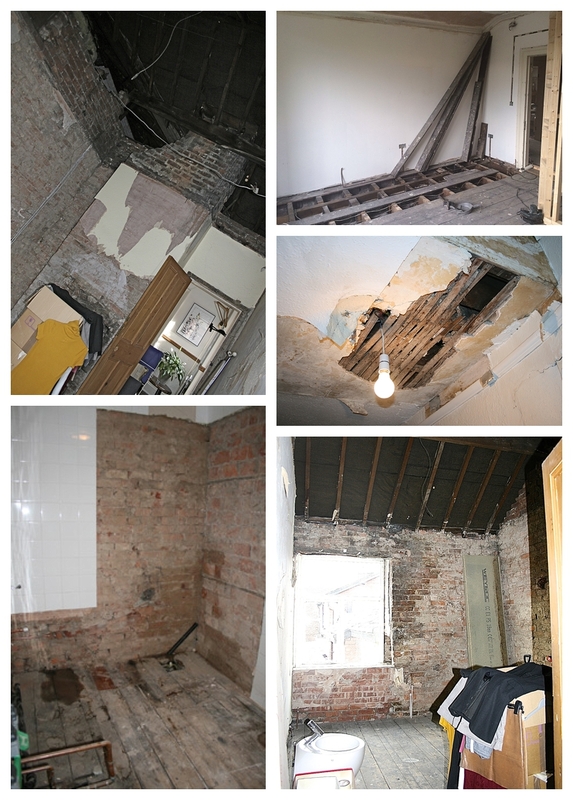 As of today we are down to three rooms, everything else has gone back to brick with no electrics. The ‘Master Bedroom’ is where we sleep, piled high with boxes, the ‘Dining Room’ is piled high with paints, files, books and is a temporary office and the ‘Kitchen’ is where everything else happens. The rest looks like this: The plan is to literally live in what’s labelled the ‘3rd Bed’ for the duration of the renovation, estimated at four months but which I reckon will be more like six before total completion, and yes, we’re popping an ensuite in there! With rooms 3m high and 5m long there will be no quick way to do things. It’s taken us this long to save up enough to start a project which can’ be done piecemeal, you can’t do a house like this bit by bit, especially if you want to knock walls down and install fabulous stuff like underfloor heating. God, knows how long Mr M & I will last before a) having a breakdown, b) escaping to The Pad or c) killing each other. Like any other normal couple in a huge renovation. I do not believe for one second all that polite niceness on Grand Designs, behind the scenes they’ve definitely got sharp instruments hidden up their sleeves!! So, what would you do to this house? And can you guess what I’ve decided on?